Welcome! 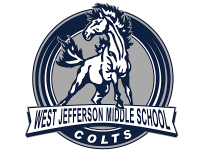 We invite you to support the West Jefferson Middle School community however you feel best. West Jefferson Middle School has served our community’s students in the three years between elementary and high schools for over forty years. PTA’s vision is to make every child's potential a reality by engaging and empowering families and communities to advocate for all children. This page is one of the ways we open a conversation so everyone with a stake in our school and our students can learn about the great things happening at West Jeff. Regular meetings are held on the third Thursday of the month during the school year at 2:30 pm in the school library.